Ed. Note: This article first appeared in the Fall, 2012, issue of The Sand Paper, the newsletter of the Anza-Borrego Desert Natural History Association. Any wash or slot around Borrego these days is likely to harbor an artist. They’re part of the statewide revival of landscape painting, spurred in part by the renewed vigor of the prestigious 100-year-old California Art Club. 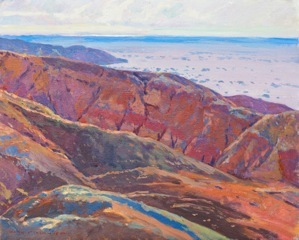 The current crop of Borrego painters follows in the distinguished steps of early landscape masters who painted here–Maurice Braun, Charles Reiffel, Marjorie Reed and Edith Purer, also California’s first woman ecologist. With the explosion of outdoor painting and the opening of a major new gallery by the Borrego Art Institute this winter, Borrego seems destined to be an arts destination. Local collector Jim Anderson says Borrego has everything it needs—isolation, iconic scenery, artists—to draw art fans. “We should definitely promote it as an artist’s retreat, like Bisbee (the eclectic mining town in Arizona),” he says. For Anza-Borrego Desert Natural History Association members, getting to know the local artists and their styles can be as rewarding as getting to know the names of 40 wildflowers. For every “known” painter there are ten discoveries waiting to be made. Due to space limitations, only a few of the best contemporary painters are profiled here. Lindemulder moved to Borrego Springs in 2007 after the Fallbrook fire destroyed her home and four years of accumulated artwork. Following the fire, she faced hip surgery, nearly died from anesthesia and was in serious need of a refuge. “I think I need a womb,” she said. Schiro discovered the Mojave desert as a toddler, romping across 120 acres his uncle owned. He studied art at California Institute of the Arts and exhibited his work widely as a modern painter. Later, while working as a producer and writer in the movie industry in LA, he developed a love for California history and the early exploration artists who toted sketchpads to uncharted places. When he took up traditional landscape painting he says he did it “for the same reason those guys did it.” Experiencing a place is paramount for him; painting it is secondary. Anderson has a demanding job as a radiation therapist, competing in outrigger canoe races in her spare time. She’s lived in Alaska and rafted all over Utah. Formerly married to a desert tortoise researcher, she has read widely in Chemeheuvi Indian and desert history. “I am a renaissance person who likes to paint,” she says. 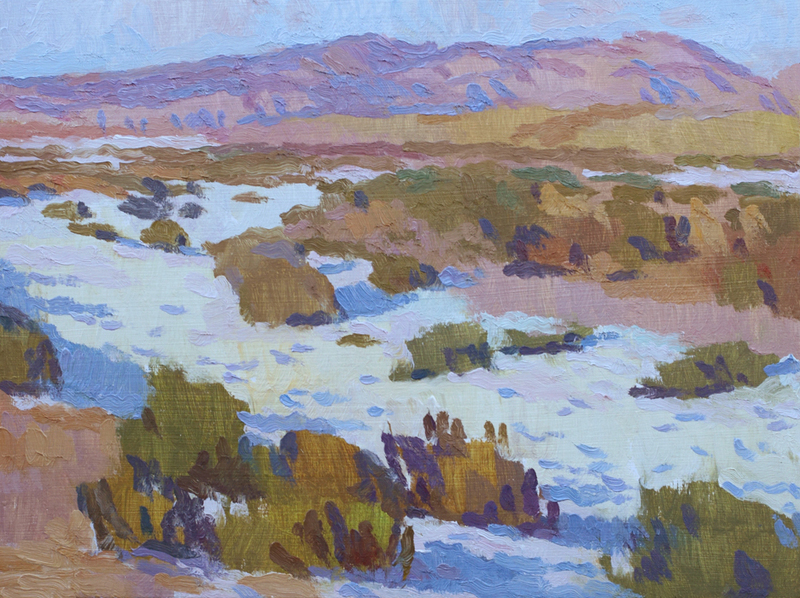 Based in Long Beach, Anderson has attended the Borrego Plein Air Invitational three times. Her subjects include iconic landscape features such as Palm Canyon and Indian Head—but also airstream trailers and roadside motels. 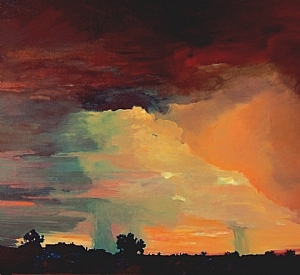 Like most of the artists featured here, she’s dedicated to conserving the lands she paints. “Contemporary plein air painting is about recording the landscape before it’s built on or torn down,” she says. Watch this artist in the future for her brainy, ceaselessly reaching paintings incorporating her wide interests in history, mythology, environment, science and nature. Director of the Borrego Art Institute, Nickerson lives part-time in Borrego Springs. In the hot months she’s found with husband Jul aboard their yacht, Sounder, in the Pacific Northwest. 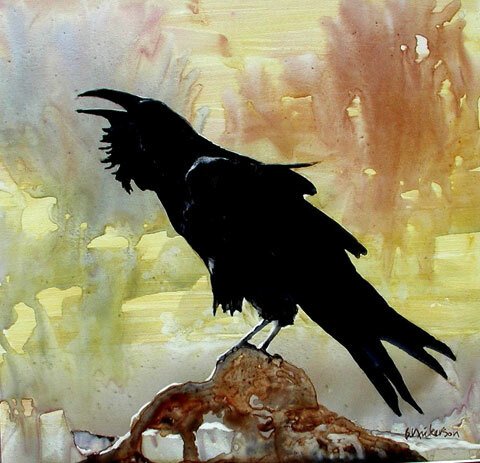 Working in Sumi and watercolor, Nickerson has painted classic Borrego subjects such as Font’s Point, the mudhill formation called the Elephant’s Knees and the resident comedic ravens. She brings texture, contemplation and a primeval feeling to any subject she tackles. Nickerson, who has a BFA from the Art Institute of Chicago, is teaching a class in Gravity Painting this season. If you’re a budding desert artist, sign up and learn to work with paint that moves in a landscape—some would say—that moves as well. A sixth generation Californian based in San Juan Capistrano, Kerckhoff is known for his elegant abstract realist landscapes. He likes to make a solo camp along the Borrego-Salton Seaway and paint “the best arroyos in the low desert for color and design”. A true naturalist-artist he can tell where he is by the color of the sand (a pink cast means he’s near the Arizona border). Kerckhoff likes working in the Arroyo Salado, Truckhaven Rocks and Palo Verde washes and a place he christened “Blistered Lip Arroyo” in honor of his own parched lips. Merrell is the historian for the California Art Club and is increasingly well-known around the state as an envoy for California art. A desert aficionado, he has completed an artist’s residency in Joshua Tree, and participated in an exhibit of Salton Sea painters, “Valley of the Ancient Lake”. He came to Borrego Springs for the first time recently as a judge for the Plein Air Invitational sponsored by the Borrego Art Institute. It was an immersion experience as the young artist was stuck in the sand at Coachwhip Canyon, impaled by a cholla on the Earth Narrows Trail and soaked up Borrego ghost stories about a driverless stagecoach each evening. He aims to return soon to visit the Pumpkin Patch and the Ocotillo Wells region. 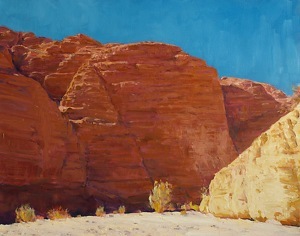 Until then, Merrell and the other highly-regarded artists featured here are Borrego’s best ambassadors–exporting images of this lesser-known desert region to LA art circles and the world. Borrego Springs is our hometown. We grew up there from 1948 through high school(bus to Julian)in 1960. Love the desert with fond memories. Hi Eric! I love Borrego too. Great place to grow up, I’m sure. I like the Geoffrey Stone painting best. There are some really good spots to paint in Utah too, especially the southern thrid of the state. Great article, Ann; such beautiful work! My favorite day at Borrego began with a low flight in a single-engine Piper. it was a spectacular prelude to the hikes to come. I’d love to see more on Borrego Springs. Nice work, esp. the Raven! All nice paintings. Eric Merrell’s painting impresses me most. Met him at his the Borrego institute during the Plein air and I was lucky to get him to sing an autograph on one of my paintings. He’s really a great guy and my source of inspiration too.